We had a new instructor today. Nothing wrong with the old one, mind you, but there was a scheduling conflict. I’m sure it’s tough juggling classrooms, simulators, instructors, students, courses, and making sure all the holes are filled. I don’t know how they keep it all straight, especially when you consider the simulator sessions (which often operate around the clock) and how many of the instructors are also Designated Examiners who administer the dreaded checkride. Anyway, the “new guy” is quite a character. John flew forward air controller missions in Vietnam and has all sorts of stories to tell. Just to show the breadth of his knowledge, when he heard that the L-3 guys in the class had a Gulfstream 350, he asked why they were in this course when the 350 was covered by the G-V type rating, not the G-IV. Within a minute of questioning, he figured out that they actually had a G-300, not a -350. He knew every serial number of 350, who owned it, and where it was based. At one point I was tossing out random G-IV airframe serial numbers and for each one he had either flown the airplane or knew who owned it. That’s the kind of experience you want from your instructor, I’d say. On the other hand, it’s unlikely any of us will be able to skate by on anything during the checkride — not that I’d ever dream of doing such a thing. It’s clear that he could operate the airplane without even thinking about it and knows even the most uncommon common errors that students make. Amazingly, we cover all the major aircraft systems in about three days. Electrical, hydraulics, avionics, pneumatics, engines, etc. I can’t say I’m 100% on any of them yet, but I’m getting there. I like Simuflite’s approach. As one of them said, they tell you what you need to know to fly the airplane, not what you need to know to build or maintain it. I’ve worked for employers who wanted you to know the most intimate details of every system — even details which weren’t relevant for a pilot. They have a wonderful training tool called SimVision, or something like that. It’s a Windows-based software program which uses the same code which runs the actual Level D simulator and the airplane. You can pan around this digital re-creation of the Gulfstream cockpit, moving knobs and switches, and then bring up synoptic pages to watch what happens. You can even put the plane up on jacks to swing the gear. It even has the same bugs that the real airplane does. For example, when one of the four hydraulic systems loses pressure for some reason, the indicated pressure doesn’t go to zero. It stops at 100 psi. It’s a known bug in the G-IV avionics, and they’ve reproduced it exactly. After class today I tried to see about getting into an RVSM or International Ops class, but they all seem to conflict with the type rating schedule. 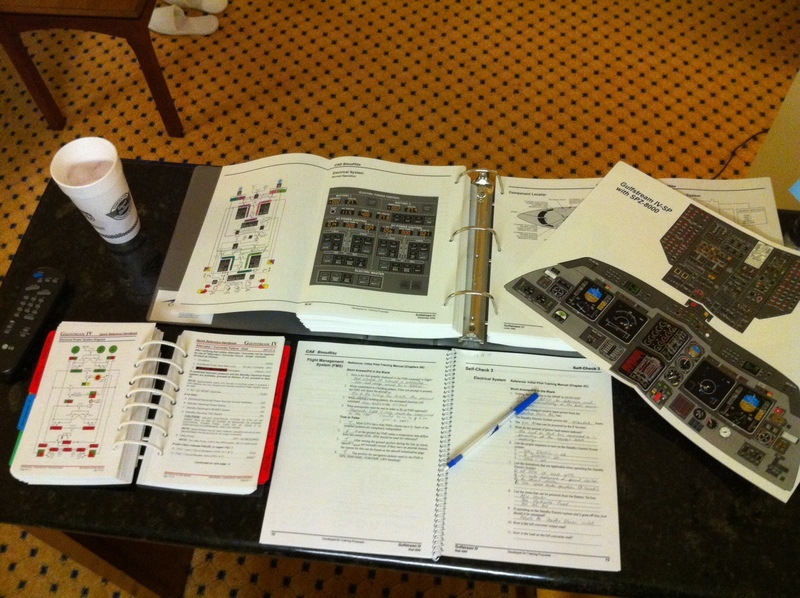 It’s probably for the best — if I’ve got time away from Simuflite, I should be either sleeping or studying for the course I’m already in. Speaking of which, that’s how I’ve spent my evening so far, and I should get back to it. I’m working on what they call a “self-check” book which takes you through the airplane and asks various questions about systems, limitations, malfunctions, etc. It’s not a formal test. In fact, the answers are all published in the back of the book. But I can already see that this will be a major resource for reviewing the highlights I’m likely to be asked about during the oral portion of the checkride. Sounds like quite the adventure Ron. Best of luck in in your training! Did you pick up a gig or are you doing this on spec to be ready for the next phase of your career. Enjoy the big D if you get some free time. Thanks, Mike. I sort of picked up a gig, although I’m not exactly sure what my work life will look like once I’m done. It’ll be fun and interesting, that’s for sure. But Kristi and I will still be stopping by the Barn and lounge from time to time to say hello and hang out. Hope to see you there and/or at the airport sometime soon!